Here at FlightCar Engineering we’re a very small team, and one of us — Timo Zimmermann — works remotely from Heidelberg, Germany. Timo’s an expert in the web framework we use, Django, and is awesome to work with: mixing together good humour, an enjoyment of teaching and learning, and deep technical expertise. One day a link to Double Robotics got passed around our internal chat room — it’s an unexpected use of Segway technology, putting an iPad on top of a mobile robot and letting a remote participant drive the robot around while video chatting. We keep a video chat with Timo open while at work, so we were pretty interested in this. There wouldn’t be much point in FlightCar buying one of these robots; our local developers fit around a single desk. Still, it would be useful to be able to video chat with Timo and have him be able to choose which of us to “look” at, as well as being able to join in with office conversations in general. Could we come up with something much simpler that still has most of the advantages of the Double robot in our situation? So, to expand on the diagram: Timo moves his iPhone, the orientation is sensed and passed on to our local iPad via the nodejs bridge (which exists just to proxy through NAT), which converts it into a single letter “r”, “l”, “u”, “d”, or “s” (for stop) and then the RFduino reads a character at a time over Bluetooth Low Energy and sends a voltage pulse to the appropriate pin. We chose iPhone orientation sensing as the control mechanism at Timo’s end, but you could also use explicit direction buttons, or even something like face detection. We decided to hide the fact that we were building this from Timo and introduced it to him as a surprise, coincidentally on Valentine’s Day. We love you Timo! 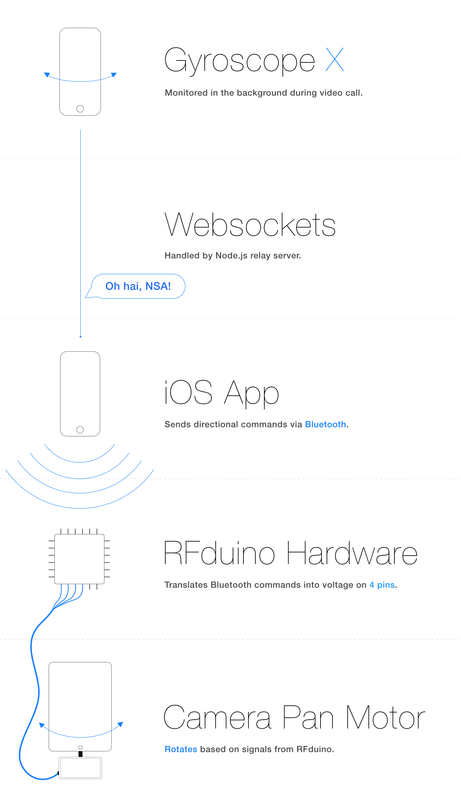 Finally, we’ve put all of the code we wrote — for the RFduino, the nodejs bridge, and the local and remote iOS apps — under an open source license on GitHub, so we’ve shared everything we know about how to build these devices. We’d be very happy if other people can help improve the features we’ve started on and find a cheaper way to build more of these! How are you finding BTLE? I’ve had… non great experiences with BT in the past, and initial attempts to use BTLE haven’t shaken my prejudice against the protocol. Did it all work swimmingly with the iDevices and what not? They spent a few months violating the GPL by shipping AVRDUDE binaries with no intent to provide source (they eventually ripped out AVRDUDE altogether rather than provide source), and as a result Linux is poorly supported for uploading code to the device. Next time I’d skip the RFduino and try to use different BLE hardware. The AAA battery sure does power the device for a long time, though. That’s a bummer all round. I would have hoped that people marketing something as “*duino” would be a little more hip. It’s not like avrdude has some super secret special awesome in it! I wish BT wasn’t so damned flaky. Does it have trouble associating even if you use “Just Works” mode? Pair this with google glass on Timo’s end, and it would be perfect. He can look around and have his hands free. What is the pin configuration from the rfduino to bescor? The bescor is a 7 pin DIN so I’m wonder what pins you are connecting to. Yup that was the case for me as well which is why I was asking about it. Thanks Chris… I’ll tinker around.